McKenzie's Corner is a 'think outside the box' program designed to engage kids in the effort to raise awareness about breast cancer, and to help keep moms healthy. How do we do expect to do that? Let's first tell you about McKenzie. The ORIGINAL Pink Fireman Coloring sheet. McKenzie is The Pink Fireman's niece. She is a witty, intelligent, wise beyond her years little girl. She might be The Pink Fireman's niece, but she knows him and calls him Uncle Marshall. We really never felt McKenzie was exposed much to Marshall as The Pink Fireman - heck, we weren't entirely sure she even knew Marshall was The Pink Fireman. That is until several years ago when she gave him a picture she colored - a fireman wearing pink! Marshall framed it and has treasured it every day since. How Does This Help Raise Awareness and Keep Moms Healthy? Kids love to color and we love to engage kids in activities! Where there are kids there are almost always parents or grandparents. While the kids color, we take the opportunity to talk to the adults about breast health and breast education. 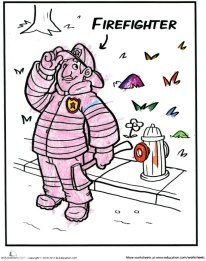 Once the kids are finished, we invite the kids to read the "Pink Fireman's Letter", located on the back of their coloring sheet, to their parents. It's a simple letter inviting the kids to be The Pink Fireman's helper, and instructing the kids to remind mommy to do things like "eat her vegetables, visit her doctor every year, and exercise". Dialogue - that's our goal. We want to start a conversation about breast health. Whether it's a conversation between two parents, a conversation between a parent and their doctor, or even a conversation between a parent and their child, when appropriate. Having a conversation about breast health is an important conversation, and our children can play an important role in that conversation - simply by doing what children love to do! We usually set-up our McKenzie's Corner Program while we're out in the community. Whether it's a festival, a school event, or a bake sale, we invite kids to come over and join us! Each child receives a pink fire helmet and a coloring sheet. For kids not staying to color but wishing to take the materials home with them, a pack of crayons is provided, if the family is in need. Can I request your program for my event, school, or group? Absolutely! We love getting out into the community with our McKenzie's Corner Program. Priority is given to groups in the MD/DC/VA area. There aren't any fees associated with bringing our program to your group. We'll bring the pink fire helmets, coloring sheets, and crayons. Consideration is given to groups outside of the MD/DC/VA area though you may be required to cover travel expenses. Do you talk to my child about breast cancer? Absolutely not. It's not our place to teach your child about breast cancer. As a matter of fact, in the fine print on the back of the coloring sheet, we abbreviate the word breast cancer with "BC". If children ask about why the Pink Fireman is pink, we simply say its to help cheer up people who are sick.